The Nintendo DSi has an internal memory, so you can download games and applications. This time I’d like to talk about the DSi Browser, which will be available for use immediately after the release of the DSi. Let’s start with self-introductions. 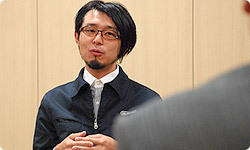 I’m Shinya Takahashi from the Software Development & Design Department. I mainly oversee teams making software development environments and teams making such software as Brain Training, English Training, and Daigasso! Band Brothers. (English Training was not released in the UK, and Daigasso! Band Brothers was a DS game released only in the Japanese market). This time, I served a relatively broad-ranging function overseeing aspects of projects such as the DSi Menu and DSi Cameras, as well as the DSi Browser, which we’ll introduce here, and the software for download later on. I’m Eiichi Shirakawa. I was in charge of the DSi Browser. I was mainly our liaison with Opera1. Also, I assessed any technological problems that arose during development and worked toward solving them. 1. Opera Software: A Norwegian software development company that has been developing web browsers for a long time. 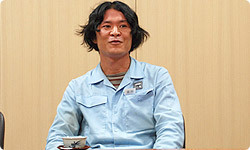 I’m Satoshi Furukawa. I usually work on game user interfaces. I’ve specialised in trying to make them as easy to use as possible. This time I was in charge of making the DSi’s Internet browser, the DSi Browser, as easy to understand and use as possible. 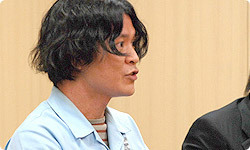 Shirakawa-san and Furukawa-san have worked on browsers since the Wii’s Internet Channel. 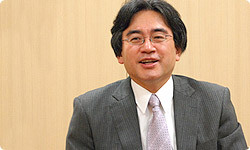 Early on in the process of making the Nintendo DSi hardware, having the browser run smoothly became a priority. Could you tell me what you were thinking at that time? My top goal was to make a browser that I myself would find satisfying to use. Simply put, in order to make it smoother, we needed to increase the response speed. We wanted to do that to the greatest extent possible. If an Internet browser doesn’t run quickly and smoothly, it isn’t worth much. I thought, if we don’t clear that hurdle, we can’t even release it, and relatively early on I encouraged the others to tackle the project in that spirit. I see. When it came to this injunction to make it “smooth,” what did you think, Shirakawa-san and Furukawa-san? Hmm… The Nintendo DSi is a handheld games console, so compared to personal computers and Wii, there are hardware constraints. Yes, the CPU and memory are comparatively meagre, and the resolution is limited. It comes down to how much you can do within those confines. Right. So the first thing we had to do was clear. With the original Nintendo DS Browser, whenever an action was performed, some time would pass before the program processed it and then reflected it on the screen. This time we decided to make that response time almost instantaneous at the rate of 1/60 of a second. Even if a webpage was going to be a little slow appearing, we wanted to at least show something moving. This had already been done for the Wii Internet Channel, so we decided to take that route with the DSi Browser as well. We asked Opera, and the people in charge there agreed, so under that policy, we made it so that users could scroll a page in real time. Those of us working on the DSi Browser came up with a slogan to describe how we wanted to make it. That slogan was “Make it Snappy!” When we were drawing up the specifications and plans, there was a lot we wanted to do to make it fun or convenient, but for a while we dropped them all and focused on making it snappy! If we tried to make something convenient and enjoyable, but it didn’t run smoothly, it would defeat the whole purpose. At first everyone is always bursting with ideas about this, that and everything, and response speed tends to get neglected. We wanted to avoid that, so we set that goal early during development. I consulted with those who had been in charge of the DS Browser and decided to temporarily remove even user-friendly features, such as functions for advanced users, in order to focus development on response speed and ease of operation. However, you were working together with Opera. While Nintendo may have had a clear policy in one direction, Opera, who have been developing browsers for personal computers for years, may have had a different set of priorities. Did they agree with you? Yes. I think our experience with Wii laid a foundation for that. 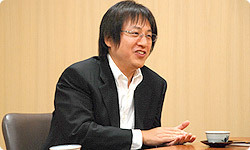 When we were making the Wii Internet Channel with Opera, we repeatedly expressed to them the areas Nintendo was particular about and our philosophy regarding the Internet in a context different from that of personal computers. Oh, that’s right. You went to Norway. To digress a little, what was Norway like? Opera’s head office is in Oslo. It was an incredibly colourful and beautiful city, exactly as one might expect from northern Europe. I could feel the history everywhere we went. In that respect, it was like Kyoto. Also, the hours of daylight vary drastically between winter and summer. When we went for development of the Wii’s Internet Channel, it was dark all day, but this time it was light all day. It was the top season for sight-seeing. Oh...the hotel prices. (laughs) That surprised me. It seems that they’re always high, but on top of that, it was the high season. I’ll just come out and say it. Rooms were 70,000 yen (£550) per night. With that hanging over us, we worked feverishly to produce results! Excellent. Many of Opera’s staff had very distinct personalities, so depending on who was in charge of something, the work would proceed quite differently. For that reason, we drew up strategies within the team for each individual, assigning work to people based on their character. (laughs) It’s a company that provides fresh discoveries every time we communicate with them. How would you describe them, Furukawa-san? My first impression was how different the atmosphere was compared to Nintendo in Japan. People of varying ethnicities and nationalities were all working together—which struck me as very fitting for an Internet company. There was a ping-pong table in the cafeteria and they often hold parties in the building. The corporate culture was rather free. Because of that, our work paces didn’t always match, but I was impressed by their open-mindedness. They didn’t flatly turn down our proposals or reject the video game culture we come from. They listened attentively and accepted our suggestions. Also, their ability to concentrate was outstanding. We often worked until late in their office, and seeing that, they would stay and lend a hand. It was a fulfilling time. I think working together with them for such an extended time had a positive effect on our work after we got back to Japan as well. So your hotel expenses didn’t go to waste.